Several years ago a customer asked me for a program that could be helpful to those suffering with bone fractures. A relative had been diagnosed with multiple bone fractures in his ankle. Since I have been counseling individuals regarding natural treatments for supporting those with bone fractures and injury for many years, I was able to provide a comprehensive program that could be helpful in recovery. More recently, we have introduced products and tools that can be even more supportive. Therefore, in this article we are providing an update to the bone fractures program. Clearly, the need for such a program is great. According to the American Academy of Orthopaedic Surgeons (AAOS), about six million individuals suffer fractures each year in North America. In about 5–10 percent of cases, patients suffer either delayed healing or fractures that do not heal. The problem of bone fractures is especially troubling for the elderly, many of whom suffer from osteoporosis, a condition in which bones become weak and break more easily. For an older person, a fracture affects quality of life because it significantly reduces function and mobility, and requires an extended period of recuperation. The bone fracture program set forth below also works well to support the healing of other types of bone problems, including broken bones, bone surgery, osteoporosis, and wisdom tooth removal. The first element of the program consists of Foundational Supplements. This group of supplements ensures the body is being supplied with all of the basic elements needed for optimal function. The primary foundational supplements consists of 1) a therapeutic multivitamin and mineral formula, 2) a complete buffered Vitamin C with antioxidants formula, 3) an essential fatty acids supplement, and 4) a high-RNA superfoods formula. 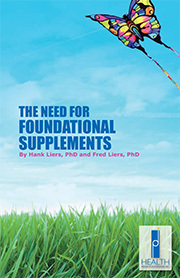 Our Foundational Supplements are described in great detail on the HPDI website where we provide a free downloadable e-book “The Need for Foundational Supplements” (.pdf). Suffice it to say that the foundational supplements are a essential part of the program that ensure healing will take place quickly and effectively. I encourage everyone to become familiar with this information as foundational supplements are basic to any wellness or healing program. The second element of the program for healing bone fractures consists of Enhancement Formulas that strengthen the body as it relates to dealing with the damaging effects of bone fractures. These include a Vitamin D3 formula with the synergistic nutrients of Vitamin A and Vitamin K2 that are required for the rebuilding of bone as well as strengthening the body in many other ways. The HPDI Vitamin D3 Plus formula to designed to specifically address this need. A second Enhancement Formula in this program is our comprehensive Bone Guardian formula that is based upon micronized veal bone that provides hydroxyapatite (Ca10(PO4)6(OH)2). Hydroxyapatite is the basic component of human bone that is 50% by volume and 70% by weight. Whereas the Vitamin D3 Plus formula builds the bone matrix, the Bone Guardian fills in the matrix with materials such as calcium, phosphorus, magnesium, boron, zinc, manganese, copper, silica, and strontium. HPDI sells Bone Guardian in both the tablet and capsule forms. The capsule form may be better for older people who are able to absorb capsules better than tablets. A third Enhancement Formula to the program is additional amounts of Vitamin C. Vitamin C is known to participate in every step of the process of building collagen, which is a key component of bone. Vitamin C has been shown to increase bone mass density. We recommend slowly increasing your intake of buffered Vitamin C until you reach your bowel tolerance. This can be accomplished by increasing your intake of HPDI’s foundational supplement PRO-C™ formula. The PRO-C has the added value of containing oligomeric proanthocyanidins (OPCs) from grape seed, skin, & pulp. OPCs in the body are able to strongly crosslink and strengthen new and damaged collagen fibers needed needed to repair bones, ligaments, tendons, and cartilage. The third element in the program are Specific Condition Formulas that directly address issues related to bone fractures. The first of these is the addition of a joint formula that allows the body to build and repair connective tissue and to significantly reduce inflammation in the area of bone fractures. In most cases of fractures there will be damaged ligaments and tendons as well as inflammation in the area. HPDI’s Joint Health Formula includes the ingredients glucosamine hydrochloride, MSM, and sea cucumber (a significant source of chondroiten sulfate) in addition to anti-inflammatory substances such as turmeric extract, rutin, and grape extract (seed, pulp, and skin) that have been extremely helpful in both repairing connective tissue and reducing pain and inflammation. A second strongly recommended condition-specific formula is proteolytic enzymes. Because it is highly likely in the case of bone fractures and injury that there is significant tissue damage, a formula with pancreatic and plant enzymes as well as anti-inflammatories can be extremely helpful is clearing out the damaged tissue. This gives the body the opportunity to begin the rebuilding process much sooner. Our recommended PROLYT formula contains the proteolytic enzymes bromelain, trypsin (pancreatic enzyme), and chymotrypsin (pancreatic enzyme), and the polyphenols/bioflavonoids turmeric extract (95% curcuminoids), quercetin and oligomeric proanthocyanidins (OPCs) from grape extract. This formula when taken on an empty stomach between meals is quickly absorbed into the bloodstream and goes to work cleaning up any damaged tissues in the area surrounding a fracture and assists in reducing pain and inflammation. A final Specific Condition Formula that I highly recommend for healing bone fractures is to rub Ancient Minerals Magnesium Oil on and surrounding the fracture area. 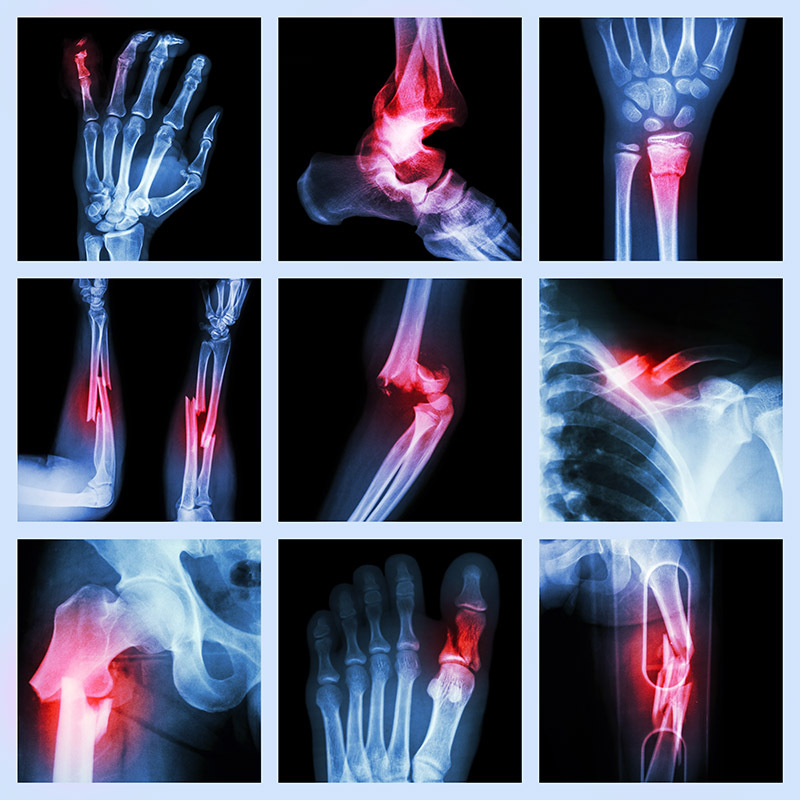 Bones cannot heal without having adequate amounts of magnesium available. Unfortunately, many people are deficient in magnesium and even taking oral magnesium cannot easily provide sufficient amounts to an area with a bone fracture. Magnesium oil (mostly magnesium chloride) is quickly absorbed transdermally (via skin) and often can provide rapid healing and pain relief! The processed food diets with a high protein and low vegetable content consumed by many people in the U.S. and elsewhere often produce conditions in the body of acidity. This in turn leads to decreased oxygenation of cells and encourages a greater amount of anaerobic processes in metabolism. In addition, when the body is acidic calcium can be taken from bones in order to balance the acidity. This can lead to poor healing of bone fractures. In order to counter acidic conditions in the body we recommend the use of HPDI’s pH ADJUST formula. As a dietary supplement, take 1 gm (about a rounded ¼ tsp) in 4-8 ounces of purified water preferably away from food, or as directed by a health care professional. For extremely acidic conditions, try 4–10 doses per day, depending on acidity level. Use pH paper to ensure pH levels remain balanced, and do not become too alkaline (alkalosis may occur above pH 8.2). 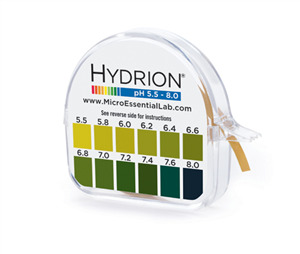 TESTING pH LEVELS: The best way to test pH levels is to use litmus paper, which HPDI offers in rolls (Hydrion brand) for this purpose. You can test salivary or urinary pH. In order to test salivary pH, simply use a small strip of pH paper to dip into a small amount of saliva. Advantages of pH paper include rapid results, ease of use, and cost effectiveness. The color of the litmus paper indicates the pH level of the body fluid tested. Most litmus paper comes with an indicator chart showing colors corresponding to various pH levels. Alkaline states will generally produce a dark green, blue or purple color (most basic). Acidic states will range from yellow (most acidic) to light green. Salivary pH and urinary pH are significantly affected by recent food consumption and other factors, so it it best to test pH hours after meals or in the morning when you awake. We prefer to measure urinary pH since results are more consistent. Measuring urinary pH is a simple as placing a few drops of urine on the paper or dipping the paper into a sample cup of fresh urine. A consistent pH measurement of less than 7.0 indicates that you are too acidic (values less than 6.2 show extreme acidity). This indicates that you should consume more alkaline forming foods (usually vegetables) and/or take pH ADJUST. A single dose of pH ADJUST can change conditions in the body from acidic to alkaline within a few hours. The VDR gene (contained in every cell of the body) provides instructions for making a protein called vitamin D receptor (VDR), which allows the body to respond appropriately to vitamin D. This vitamin can be acquired from foods in the diet or made in the body by exposure to from sunlight. Vitamin D is involved in maintaining the proper balance of several minerals in the body, including calcium and phosphate, which are essential for the normal formation of bones and teeth. One of vitamin D’s major roles is to control the absorption of calcium and phosphate from the intestines into the bloodstream. Vitamin D is also involved in several process unrelated to bone formation. VDR attaches (binds) to the active form of vitamin D, known as calcitriol. Calcitrol is produced in the body from Vitamin D3 (cholecalciferol) in the liver and kidneys. The interaction with calcitriol allows VDR to partner with another protein called retinoid X receptor (RXR). The resulting complex of proteins then binds to particular regions of DNA, known as vitamin D response elements, and regulates the activity of vitamin D-responsive genes. By turning these genes on or off, VDR helps control calcium and phosphate absorption and other processes. In recent years, genetic tests have become available that show VDR variations can cause serious conditions related to low bone density and other important body functions such a higher blood glucose levels or lower immune system function. If a person is having little success in healing bone fractures, it is possible that VDR variations are a key factor of causation. In such cases, we recommend having genetic testing done to determine if VDR variations are present. Recently, HPDI has teamed with a genetic testing company (BodySync, Inc.) and sells the BodySync test kits on our Reseller site. Please click here to see our blog article regarding the BodySync genetic test. Among the genes tested for in the test are three variations of the VDR gene. Resellers can purchase the test kits directly from HPDI and retail customers can call us (800-228-4265) to find out how we can help them get a test kit and support them with any associated counseling regarding the results. I have included all of the above supplements including recommended dosages plus more related to having an excellent diet in the table provided below. PRO-C™ 2 caps 2 caps 2 caps Take with meals or with snack. 3 caps Take with meals. 1 tab Take with meals. Essential Fats plus E 2 softgel 2 softgel 2 softgel Take with meals. PROLYT – Proteolytic Enzyme Formula 2 caps 2 caps 2 caps 2 caps Take between meals. 1/2 tsp 2 tabs or 1/2 tsp 2 tabs or 1/2 tsp Best with meals, but other times are okay. Start with 2 tabs or 1/2 tsp twice per day and add another 2 tabs or 1/2 tsp every few days until you are taking 8 tabs or 2 tsp per day. Vitamin D3 Plus 5,000 IU 1 softgel 1 softgel Take with meals. Reduce to 1 softgel after 2 months. Joint Health Formula 2 caps 2 caps 2 caps Take between meals and away from Bone Guardian. Magnesium Oil 10 pumps 10 pumps 10 pumps 10 pumps Spray on affected area – or nearby area. Rejuvenate! (original) 1 scoop 1 scoop Take as a meal by itself or with fruit/berries. Additional nutrients that may be helpful include pH ADJUST (to balance excess acidity in the body), Warrior Mist™ for pain relief (rub on adjacent area several times daily), Echinacea (as drops or capsules), N-Acetyl-L-Cysteine – NAC (2 gms per day), Progesterone Cream – for women (1/4–1/2 tsp twice daily), and Prescript-Assist™ probiotics (2 capsules daily) if on antibiotics. Consume a diet that provides good amounts of protein which is needed by the body to support the healing of bone fractures. Eat meats, poultry and fish (e.g., sardines, salmon, mackerel) in the amount of a 5–10 ounces per day. Ensure a good intake of organic vegetables, including high levels of dietary fiber. Drink 16 oz per day of fresh vegetable juices from carrot, celery, beets, cabbage, etc. Other healthy foods (preferably organic) include fruits, whole grains (e.g., brown rice, millet, and quinoa), beans, nuts and seeds (sunflower, chia, flax, pumpkin, almond, walnut and sesame in small amounts — 2 or 4 ounces — are good). Try eating Hank’s Vegetable Soup several times a week. Avoid all sweets (sugar), processed/refined foods (white bread and pasta), preservatives, and artificial flavors and colors. Vary your diet. An additional treatment that can be useful is hydrotherapy. In particular, hot and cold showers are a very effective way to move the blood and create circulation. This can speed up both detoxification and delivery of healing nutrients to the area of a bone fracture. Here’s how to do this. Once daily, take a complete hot and cold shower. You will start with hot water for one minute, then cold for one minute. Repeat this seven (7) times so the shower should last about 15 minutes. Another time, daily, you can perform a complete hot and cold shower routine again or a partial one just applying the water directly to or near the area where there is a bone fracture. While you are doing both hot and cold showers, pay special attention to any affected area and massage it as vigorously as is safe and comfortable. If a shower is impossible, then alternate hot packs and ice packs on the area of the bone fracture. By following the recommendations and suggested supplement schedule, healing time for bone fractures can be significantly reduced and fractures may heal more completely with fewer complications. By ensuring your body receives the proper nutrients it needs to heal itself, and by engaging in other relevant practices (e.g., hydrotherapy), you and/or your loved ones may be able to deal with bone fractures successfully, and continue a healthy, vibrant lifestyle. Got potassium? You heard me right. Po-tass-i-um. Well, no—you probably don’t get enough—and you’re not alone. Fewer than 2% of people do. Experts say 4,700 milligrams (4.7 grams) of potassium is the minimum daily intake required for health and to reduce risk of chronic disease. Yet, the National Health and Nutrition Examination Survey (NHANES) reports the average potassium intake for Americans is 2,640 milligrams (2.6 g) daily. This low intake remains unchanged over decades! Most people get less than half the amount of potassium needed to meet “adequate” or minimum levels. Given essential roles played by potassium in the body, and the known health benefits it confers, almost everyone — including you — can benefit from additional potassium. From where will it come? That is to say, will the average person really meet recommended potassium intake from diet alone? I’m a huge advocate for increasing intake of dietary potassium, but long-term evidence suggests the answer is “no.” Supplementing with certain forms of potassium can be an effective adjunct to dietary intake. It therefore can be highly beneficial to take a potassium-containing formula like pH Adjust, which provides potassium bicarbonate that boosts potassium levels and powerfully alkalinizes the body. 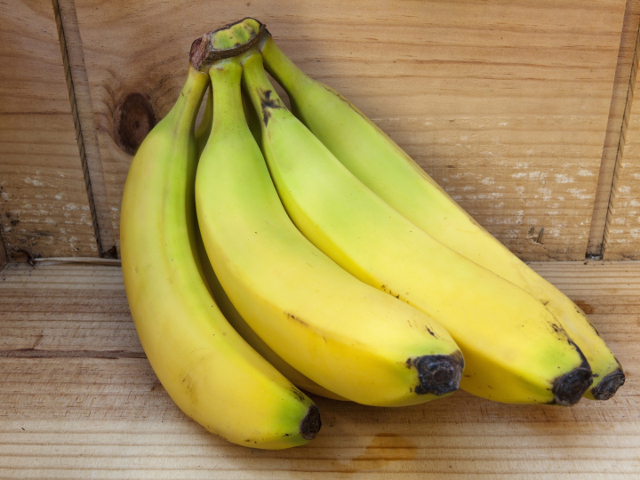 Bananas provide potassium (400–800 mg), but not if you don’t eat them! For years, a parade of minerals—calcium, magnesium, zinc, iodine, and yes, sodium—have drawn attention from health professionals, consumers, and the media. Whither potassium? Yet despite compelling scientific studies, articles, and books, potassium has not “caught on” among doctors, consumers, or health aficionados. Nevertheless, knowledgeable health professionals and a small number of health-consious individuals have known of its importance for decades and longer. Potassium has become known as the “forgotten” or “neglected” mineral. It’s time to revisit what we thought we knew…or never knew. It’s time to recognize potassium as “first among equals” in the pantheon of macrominerals. If you think you know potassium, prepare to think again. The symbol for potassium is “K” in the periodic table. It is one of seven essential macrominerals including calcium, magnesium, phosphorus, sodium, chloride, and sulfur. POTASSIUM – NEEDED MORE THAN EVER? Beyond the benefits you may take for granted that are provided by the mineral you don’t get enough of…there are many reasons why potassium is more important than ever. One major reason potassium is needed more than ever: sodium. Sodium is the essential macromineral no one seems to be lacking. Just the opposite! When people talk about sodium, it is usually about how to avoid it. 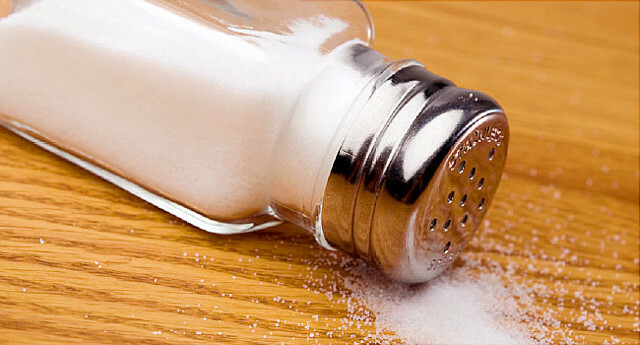 Sodium is blamed for hypertension and adverse cardiovascular health. What is the connection between sodium and potassium? It all starts at the level of the cell with the “sodium-potassium pump” (or N+/K+ pump). The sodium-potassium pump is responsible for keeping sodium out of cells and keeping potassium in. But it also a carrier for nutrients going into cells, and it is involved in the energy production. The typical modern diet —low in potassium and high in sodium (and sugar)—is a major problem for cells because it compromises the function of the sodium-potassium pump. Optimal function of the sodium-potassium pump requires not only increasing potassium intake, but also reducing sodium intake. • High “K Factor”: During evolutionary history, humans consumed 5–10+ times more potassium than sodium. Because the prehistoric diet contained little sodium, the body developed means for conserving it through resorption. Conversely, our potassium supplies were higher, and therefore the body developed no system for conserving it—it is absorbed, filtered by the kidneys, and eliminated. • Cellular imbalance between potassium and sodium can cause strokes and other damage without increasing blood pressure (K Factor xxix). An exclusive focus on decreasing blood pressure (whether through diet or drugs) that fails to take potassium into consideration may not produce desired results. • The sodium-potassium (Na+/K+) pump is an important pump that exists in cells. Its job is to keep sodium levels low in cells (pump out sodium and wastes) and pump in potassium, glucose, and other nutrients. Sufficient potassium is critical for this all-important pump that keeps us healthy. • When sodium (salt) levels are high and potassium levels are low, the pump does not function efficiently. Cells cannot prevent sodium from entering, causing them to swell from osmotic pressure, and causing metabolic blockage. • The sodium-potassium pump uses sodium as a “carrier” to bring in potassium, glucose, and other nutrients. For every glucose molecule, two sodium molecules are pumped into a cell. With high sodium intakes, cells become overloaded with sodium, and the pump works far less efficiently. • Low potassium creates greater imbalance preventing the pump from excreting sodium, and also preventing nutrients from entering cells. The cell produces less energy and enters a type of metabolic stasis. • Studies show the greatest decreases in blood pressure occur not only when sodium intake decreases, but when potassium intake simultaneously increases. The role of potassium in the sodium-potassium pump has implications for nearly every function in the human body. And potassium does a lot more. Potassium provides many benefits. These include known benefits for reducing hypertension, stroke, osteoporosis, and kidney stones, as well as supporting cardiovascular health, and stabilizing blood glucose. 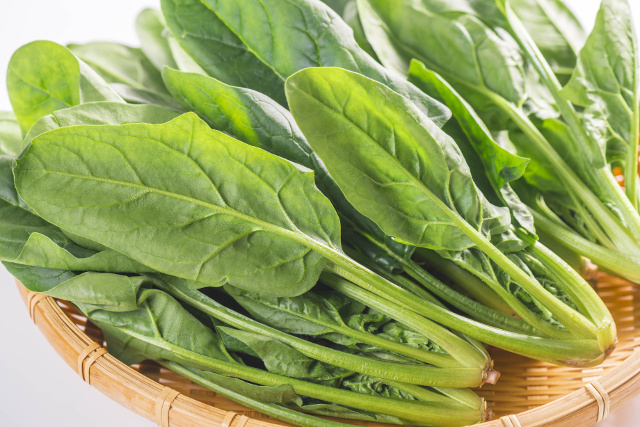 Many of potassium’s benefits relate to its role in the sodium-potassium pump. Other benefits relate to different aspects of potassium. Among the most significant features of potassium is its ability to alkalinize the body. Potassium neutralizes acids by itself and especially when combined with minerals such as bicarbonates. I have recently posted several articles that discuss potassium’s role in keeping the body alkaline. Specifically, how consuming more potassium-rich fruits and vegetables remains the most important means for maintaining alkaline conditions in the body. Consuming more potassium-rich fruits and vegetables can help maintain proper pH in the body. The alkaline-forming minerals include potassium, magnesium, calcium, and sodium. They work together to keep you alkaline—all are important. Yet, in terms of what in your diet most drives alkalinity, potassium is the king. In fact, certain measures of pH indicate that alkalinity is a function of potassium intake. This means potassium intake most effectively creates alkaline conditions. High dietary intake of potassium-rich, alkaline-forming fruits and vegetables (especially leafy green vegetables) and vegetable juices is the best way of supporting proper pH. This is a proven means for balancing the effects of acid-forming foods like meats, and most grains and starches (simple carbohydrates). Known factors producing overly acidic conditions in the body include consuming meats, sugar, processed foods, and simple carbohydrates like wheat, corn, rice, and most pastas and breads. The human story behind potassium begins with dietary intake. Once upon a time, we “got plenty” of potassium in our diets. Now, not so much. Indeed, humans have a long history of high potassium intake from foods. Our paleolithic ancestors ate a lot of vegetables, fruits, and nuts—all of which are high in potassium. This helped balance their intake of nutrients from animal foods, which are typically lower in potassium. During the rise of agriculture (20,000–30,000 years ago) and settled communities, grains became a significant portion of our diet. Yet, grains contain relatively low levels of potassium. In addition, salt was added to foods in larger quantities as a preservative and taste enhancer. A long, slow slide toward decreasing potassium levels— and simultaneously increasing sodium levels—was set in motion. Sodium is an essential mineral for health—it is one of the alkalinizing minerals. But historically, humans obtained 5–10+ times as much potassium as sodium. We have now “successfully” reversed potassium preponderance by consuming 2–4 times as much sodium as potassium. This causes lots of problems, and is one of the major elements creating dysfunction in sodium-potassium pumps in cells (see above). In our modern age, and especially since the later decades of the the 20th century, intake of fresh vegetables and fruits has fallen dramatically. And so has the dietary intake of potassium. The 20th century witnessed an unprecedented and dramatic rise in consumption of processed, packaged, and “fast” foods — most of which are low in potassium and high in sodium. Beyond the rise of processed foods, there are declines in nutrients (including potassium) in foods due to steadily poorer soil quality on farmland. And adverse impacts on nutrients in food crops relating to the rise of industrial agriculture—with its dependency on chemicals—and failure to replenish soils. Potassium remains high in vegetables and fruits, including dried fruits. And vegetable broths. The best solution to low intake of potassium in the diet is simply consuming higher levels of vegetables and fruits, especially those that are fresh and organic. Got spinach? It provides 800 mg potassium per cup! Leafy greens (raw or cooked) are among the very best sources. Beet greens contain 1,300 mg of potassium per cup and spinach about 800 mg per cup. Fresh carrot juice is my favorite providing nearly 700 mg per cup. Even comfort foods like baked potatoes (or sweet potatoes) provide high levels (1,000 mg) with skin. Avocado lovers rejoice, as there are 400–500 mg per avocado. Beans and nuts are good sources, too. Fruits like bananas (400 mg), cantaloupe (350 mg), and even fruit juices like orange juice (650 mg) are significant sources. Among animal foods, fish, chicken, and pork are highest in potassium. Nutritionists frequently suggest a 80–20 rule: simply consume 80% alkaline-forming foods to 20% acid-forming foods. With this simple 80–20 formula, nearly everyone can achieve high—or at least adequate—potassium intake through their dietary choices. The question is: Will people CHOOSE high-potassium foods? Do you? You can point a person to high-potassium foods, but you can’t make them eat them. Despite exhortations from all sides for greater consumption of vegetables, fruits, nuts, and other high-potassium foods, “potassium sufficiency” isn’t the reality for most people. Potassium intake has been steady for decades. Regarding sodium, it is just as easy (and important) for most people to decrease sodium in the diet as it is to increase potassium intake. Reduce use of salt. Choose low-sodium options when possible. Sodium is now on the radar as a mineral that promotes hypertension, so low-sodium options are increasingly available. But like eating more fruits and vegetables, getting more exercise—and other things we know we “should” do—reducing sodium requires a conscious effort. The first part is awareness on the part of the individual. That leads to greater responsibility. Too much sodium and insufficient potassium in the diet describes modern life. I also believe manufacturers, restaurants, and the food industry in general should voluntarily limit the amount of sodium they put in foods. That would go a long way toward making it easier to reduce salt. Coming back to potassium, an interesting fact is that based on US research, Finland in the 1990s replaced their salt shakers with potassium shakers. It’s true. And among other benefits, the incidence of strokes and heart attacks decreased by 60%. Much can be done by individuals to improve their lives by increasing their potassium intake. Unless and until people eat enough high-potassium foods (and/or the US replaces its salt shakers with potassium shakers—which actually would help solve two problems), another viable option is potassium supplements. For individuals who do not (or will not) consume sufficient potassium in their diets—this includes the vast majority of people—potassium supplementation can be beneficial. Even for those who often consume adequate potassium, but sometimes fall short, supplementation is a useful option because it allows for increased potassium intake during times when they need more of it. And who doesn’t? There are various potassium supplements, typically either capsules or alternate “salts” comprised partly or wholly of potassium bicarbonate. This form of potassium found naturally in fruits and vegetables (versus potassium chloride), and therefore is considered safe. Even when taken in amounts beyond normal recommended daily values, excesses will typically be excreted. A few caveats. Most nutritional supplements only provide small amounts (100 mg) due to government rules created to avert “hyperalkemia,” defined as too much potassium in the blood. Hyperalkemia can be caused by acute or chronic kidney failure, so if you suffer from kidney failure, please leave potassium supplements alone. Hyperalkemia can also be caused by medications, such as angiotensin-converting enzyme (ACE) inhibitors (taken for lowering high blood pressure, ironically), non-steroidal anti-inflammatory drugs (NSAIDS), and blood thinners like heparin. It may also relate to alcoholism, diabetes (type 1), or excessive use of potassium supplements. The “normal” range of potassium in blood is 3.6–4.8 milliequivalents per liter (mEq/L). Given that most people do not obtain sufficient potassium, eating more fruits and vegetables and perhaps taking a high-quality potassium supplement will help the average person. That is, most people benefit from more potassium—not less—which they can get from diet and/or supplements. 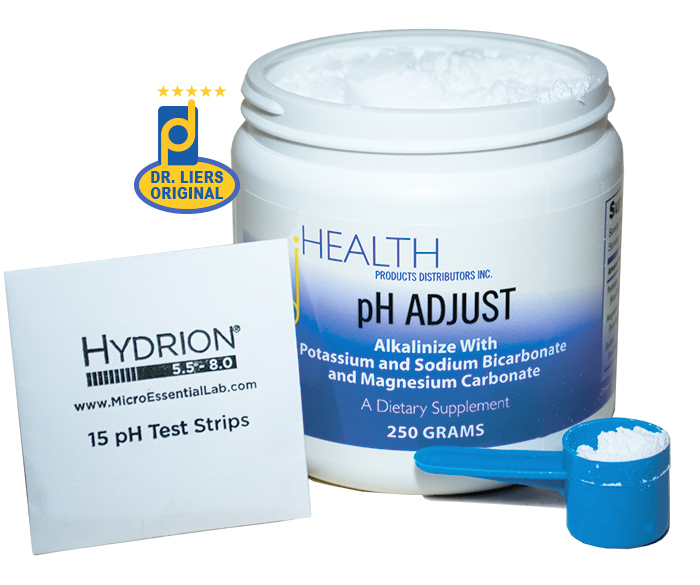 HPDI recently launched pH Adjust, which is probably the world’s most sophisticated alkalinizing formula. pH Adjust is not a potassium supplement, per se. Yet, it provides easily assimilated potassium as part of a synergistic formula (including other important macrominerals) that is exceptionally well designed for increasing pH levels in the body. pH ADJUST provides potassium and sodium bicarbonates and magnesium carbonate for alkalinity. pH Adjust is already popular because many people are overly acidic due to dietary and lifestyle choices, including—but not limited to—not consuming enough vegetables and fruits and over-consuming meats, grains, and other acid-forming foods. pH Adjust is an excellent formula for those interested in safely and rapidly increasing their pH to overcome acidosis, and creating alkaline conditions in the body. One gram (1/4 teaspoon) of pH Adjust provides 141.7 mg of potassium from potassium bicarbonate and potassium glycinate. This means that one teaspoon — which is the amount I take daily — gives me 567 mg (.567 g) of potassium. That is not a huge amount of potassium, perhaps as much as you would obtain from mid-sized banana. However, if you consider that pH Adjust is a dietary supplement, which in conjunction with improved diet (i.e., consuming more potassium-rich foods) can make a difference in your potassium intake. And for the many individuals whose potassium intake is less than 2.6 g — recall that 2.6 g is the AVERAGE intake — a 1/2 gram increase in potassium can make a big difference (a 20% boost!) in terms of improving total intake. Then consider the “healthy” person whose potassium intake may hover around 4 g, which is above average, but less than the suggested 4.7 g intake level. One teaspoon of pH Adjust will move them into the range where they will meet— or get much closer to—the recommended daily intake. Taking one teaspoon of pH Adjust daily not only helps boost potassium intake, but represents a HUGE move toward being alkaline, which is a major benefit for health, as I wrote in my last blog article. Equally important in terms of alkalinizing the body, the bicarbonate form of potassium in pH Adjust is hugely alkaline-forming. That is, while potassium itself neutralizes acids in the body, potassium bicarbonate is substantially more alkalizing because of the tremendous alkaline-forming power of bicarbonate. That is why HPDI created pH Adjust—to rapidly and effectively create alkaline conditions in the body. Other significant facts: pH Adjust contains magnesium carbonate and sodium bicarbonate. Magnesium carbonate helps neutralizes stomach acids (hydrochloric acid) and then after it is absorbed (as magnesium ions) it continues to neutralize acids throughout the body. The sodium bicarbonate similarly splits: sodium neutralizes acids and bicarbonates alkalinize the body. pH Adjust provides a 3:1 ratio of potassium to sodium. This ratio is known to be ideal for optimal uptake of potassium. 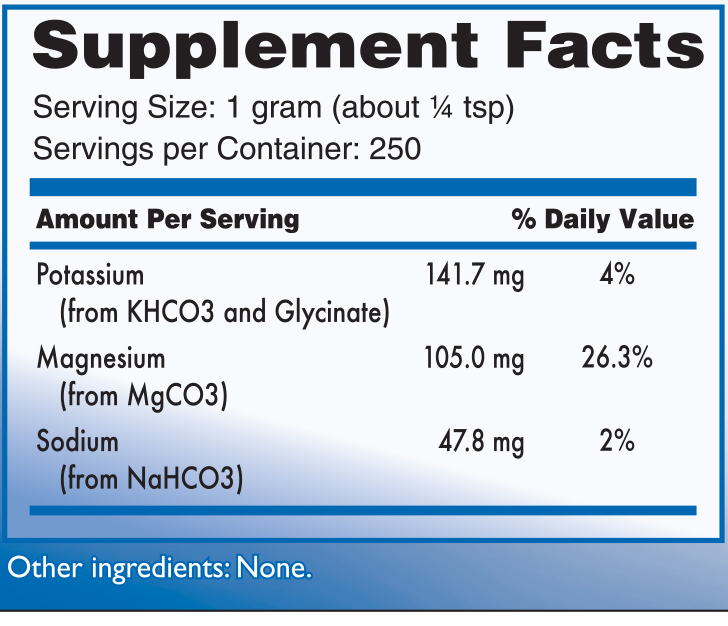 pH Adjust provides 141.7 mg potassium and 105 mg magnesium per 1/4 teaspoon serving. Potassium powers sodium-potassium pumps in your cells and keeps you alkaline. It supports proper blood pressure and cardiovascular function. It balances the effects of sodium and works synergistically with other macrominerals keeping you healthy. Potassium loves you. Yet, you hardly know potassium—or how deficient you are. Love potassium like it loves you. Eat more potassium-rich fruits, vegetables, and fresh juices. Take a potassium-containing formula like pH Adjust. Not only will it supply you with easily assimilated potassium, but also powerfully boost your alkalinity. Eat less salt. For God’s sake, eat less salt. Do all these things. Then it’s likely your poor sodium-potassium pumps will revive themselves. I promise, you will feel it! This article is dedicated to the memory of our friend Dr. Victor A. Galunic, who provided HPDI with information, resources, and technical assistance. You’ve heard it before. Eat more fruits and vegetables to be alkaline. Consume more alkaline-forming foods. Eat fewer acid-forming foods to avoid acidosis. Balance your pH levels. Maybe you’ve even studied lists or charts of acid- and alkaline-forming foods to encourage dietary choices for creating proper acid-alkaline balance. It’s no secret that acid-alkaline balance is important for health. In fact, it is well established that pH levels in the range of 7.35–7.45 provide many benefits. The facts are the facts, and the science is sound. Consuming more alkaline-forming fruits and vegetables can help maintain proper pH in the body. Yet, if creating alkalinity were that simple, then why are most individual’s pH levels acidic instead of alkaline? What can be done to remedy the endemic (and epidemic!) levels of acidosis we see today? Consuming potassium-rich fruits and vegetables remains the most important means for maintaining alkaline conditions in the body. However, taking pH Adjust powder supplement is an effective adjunct not only for helping balance pH levels, but rapidly producing an alkaline state conducive to optimal health. A pH of 7 is considered neutral. A slightly alkaline pH level – like 7.4 – is best for health, of course. Dietary intake of alkaline-forming foods is the most obvious way of supporting proper pH. Consuming a diet rich in alkaline forming foods, such as fruits and vegetables (particularly leafy green vegetables) and vegetable juices are proven means for successfully balancing the effects of acid-forming foods like meats, and most grains and starches (simple carbohydrates). Vegetables and fruits contain potassium. Evidence shows that potassium is critical for producing alkaline conditions in the body. Despite the certain knowledge that consuming vegetables, vegetable juices, and certain fruits helps balance pH, most people’s pH levels are overly acidic. I personally know many people, often vegetarians, whose pH levels are perfectly within the range suggested for optimal health. Yet, I also see that most people do not consume sufficient alkaline-forming foods (specifically vegetables and vegetable juices), and therefore I am not surprised that the pH levels of most people are overly acidic. What people in the thick of life may not realize is the degree to which acidosis—chronic or otherwise—is taking a toll of their health. And how maintaining alkalinity can improve health, longevity and quality of life. Or how easy it can be to create and sustain alkaline conditions using diet and dietary supplements. Government statistics show that individuals by far do not consume recommended amounts of fruits and vegetables. It makes me wonder what foods the average individual or family consumes daily. Fast foods, fried foods, GMO foods, sugar-laden foods, and processed foods, as well as artificial additives, pesticides and agricultural chemicals are not conducive to alkaline conditions. Neither are high-nitrogen foods, like red meats and most high-protein animal foods, especially when over-consumed—and not balanced by potassium-rich plant foods. It seems the diet and lifestyle of most people are such that they are overly acidic. This may be considered a symptom of “modern” life. Yet, while the acid-alkaline balance of ancient diets—and even the diets of Westerners into the 20th century may have been fundamentally better (i.e., more alkaline-forming), the principles of pH balance remain the same. The pH levels of individuals subsisting on grains in any historical period would be relatively acidic. Beyond low potassium intake from vegetables and fruits, other factors associated with over acidity include alcohol and most pharmaceuticals, antibiotics, artificial sweeteners, preservatives and artificial colorings, low nutrient intake, chemical exposure, pollution, lack of exercise, shallow breathing, and chronic stress. Given the prevalence of these factors, is it any wonder that maintaining alkaline conditions in the body has become difficult for the average person? Importantly, studies indicate that long-term acidosis is linked to certain health conditions, including arthritis, diabetes, fibromyalgia, heart disease, osteoporosis, stroke, and other adverse conditions. The answer for maintaining alkalinity is to consume plenty of potassium-rich fruits and vegetables. Most people know that it is important to eat 4–6 servings of vegetables daily. Yet, how many actually do? And why is that? Not unlike taking daily multivitamins and sufficient quantities of basic dietary supplements, maintaining proper pH levels is easier said than done for most people. It just is. For example, what if you normally consume sufficient amounts of fruits and vegetables, but you are traveling? Or find yourself on a given day not maintaining sufficient intake to maintain optimal pH balance? Or inadvertently become exposed to “factors” that create acidosis? If you regularly consume sufficient levels of vegetables, vegetable juices, and certain fruits, you will most likely be slightly alkaline most of the time. If you do not, then you will either need to increase your intake of these potassium-rich foods, or try something else, or both. How do I know this? Because despite my rather large intake of vegetables, vegetable juices, and fruits, I discovered that I am myself not always sufficiently alkaline. When I recently used litmus paper to test my pH levels, I found to my surprise that I am not *always* as alkaline as I should be. Fortunately, my father Hank Liers, who is our company’s formulator and founder, had something brewing in his mind the last few years. Just as I was deeply wondering how to squeeze more vegetable juices into my busy schedule…he develops a formula that forever changes my perspective on acid-alkaline balance, not to mention keeping me alkaline — like all the time. It is amazing and it is “something else.” He calls it pH Adjust. And that is what it does—adjust your pH—and fast! 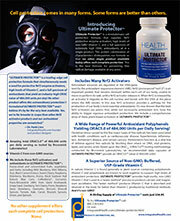 pH ADJUST can safely and effective alkalinize the body. After taking a single dose of pH Adjust, my pH “litmus” paper turned from light-ish green to deep purple. After taking a dose every day for 10 days, my litmus test paper is dark blue to purple nearly all the time. In addition, my father, Dr. Hank, has noticed that by taking a single large dose (a rounded teaspoon) every morning upon arising and measuring his urinary pH levels shortly before taking the dose, his morning pH levels are consistently in the 6.8 to 8.0 range. Before initiating this practice his morning urinary pH range was 6.2 to 6.6. Using this same protocol, my mother has experienced the same pattern of morning urinary pH values. Of course, urinary (and salivary) pH measurements over the day will show significant variations depending upon your dietary habits. However, it was noticed that the trend was to have the pH increase over time as the protocol was rigorously followed. What changed? Well, our pH levels have changed—toward alkalinity—for one thing. For another thing, I notice I have greater stamina, breathe easier, and just “feel” better. Another unexpected benefit: my teeth feel stronger. Go figure! I thought about it and I see that my body must be retaining minerals better. When the body is acidic, minerals are required to “buffer” the acidity. The body will even pull minerals from bones or teeth to buffer acidity because it tries to balance acidity any way it can. Does this mean you can stop eating vegetables—and just take pH Adjust? Absolutely “no” because your diet remains the single most important factor in keeping your body slightly alkaline. If anything, your intake of potassium-rich fruits and vegetables (like kale and other leafy greens) should increase or at least be maintained, if it is already sufficiently abundant in these foods. I cannot guarantee you will get the exact results I obtained. Your results will depend on your diet, level of acidity, and exposure to other factors known to determine pH levels. Nevertheless, the science behind the development of pH Adjust is based on the fact that certain key forms of minerals like potassium and sodium bicarbonate and magnesium carbonate create alkaline conditions in the body. pH Adjust is a fluffy, mild-tasting power formula you add to water, juice, or other liquid drinks in small amounts (about 1/4 teaspoon) that rapidly “adjusts” your pH levels toward alkaline. pH Adjust contains potassium bicarbonate, magnesium carbonate, potassium glycinate, and sodium bicarbonate. A one gram serving (about a rounded ¼ tsp) contains about 300 mg of bicarbonate, 260 mg of carbonate, 142 mg of potassium, 105 mg of magnesium, 48 mg of sodium, and 100 mg of glycine. Potassium, sodium, and magnesium are key minerals involved in many important functions in the body. When combined in bicarbonates (potassium & sodium), carbonates (magnesium), and glycinate (potassium) they help to adjust and balance pH levels essential to optimal body function. You can read more in depth about pH Adjust on our product page. For years, health professionals have advocated the use of baking soda (sodium bicarbonate) for its alkalinizing effects and the benefits associated with balanced pH levels. Baking soda is cheap and effective, but consuming it has drawbacks. Its key flaw is sodium. Sodium bicarbonate provides relatively too much sodium (salt), and as such, its consumption must be monitored so as to avoid elevated sodium levels. Too high sodium levels create known risks for high blood pressure (hypertension) and cardiovascular health. pH Adjust is formulated to avoid high sodium levels. One key to the formula is its 3:1 ratio of potassium to sodium. These are balanced amounts, as well as levels the body itself favors in terms of absorption and retention. Moreover, these levels maintain a balance known to be heart-healthy and that keep the formula low in sodium, when used as directed. Most individuals already consume sufficient (or more than sufficient) sodium, and therefore require other minerals to balance that intake. pH Adjust not only contains low levels of sodium, but also provides minerals (potassium, magnesium) needed to balance sodium levels in the body. 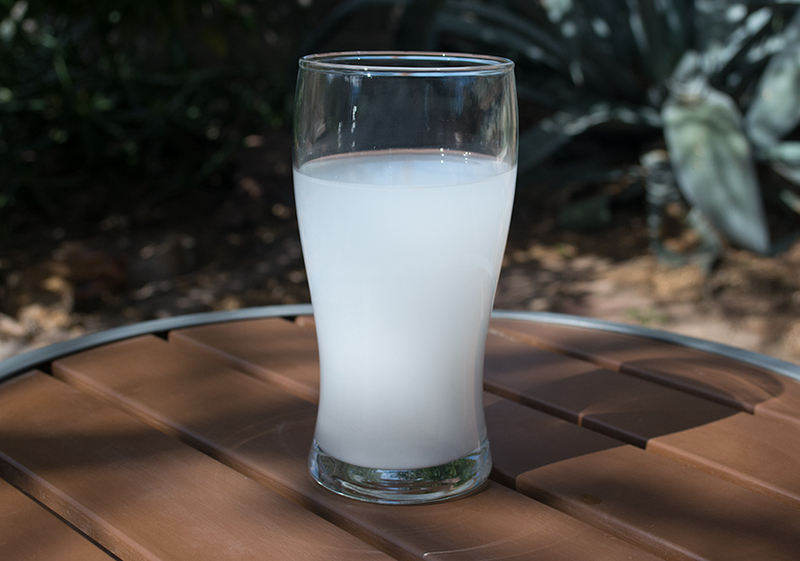 A refreshing glass of water with pH Adjust. Can alkalinizing get any simpler? Taste is another advantage of pH Adjust. Baking soda literally tastes “salty” because it is full of sodium. For a long while, I used baking soda to balance my pH levels toward greater alkalinity. I stopped taking baking soda not only because my dietary intake of alkaline-forming foods is usually sufficient (relative to the average person), but also because I no longer could stomach the salty taste. I continue to “slug” down baking soda every now and then, but I have to suppress my overriding desire to spit it out—it’s simply too salty! Imagine me now: happily drinking my pH Adjust in water every morning (and sometimes afternoon) which tastes good! I cannot actually say it tastes like a dessert because it is more like neutral to slightly sweet in taste (partly due to its glycine content). It goes down smoothly with no detectable “salty” taste. I would say pH Adjust has everything I would ask for in an alkalinizing, pH balancing formula. It alkalinizes me–FAST! It provides critical minerals required for health in balanced amounts, including potassium and magnesium in easily assimilated forms. It is low in sodium. It tastes good. What more can you ask for? pH Adjust probably is the most sophisticated alkalinizing formula available. Certainly it is better than calcium- and chemical-laden antacids, which I would never take anyway. pH Adjust’s elegant design makes baking soda seem plain and salty by comparison not to mention highly imbalanced in terms of its mineral content. No one can really know the effects of such an excellent pH balancing formula as pH Adjust without accurately measuring their pH levels. 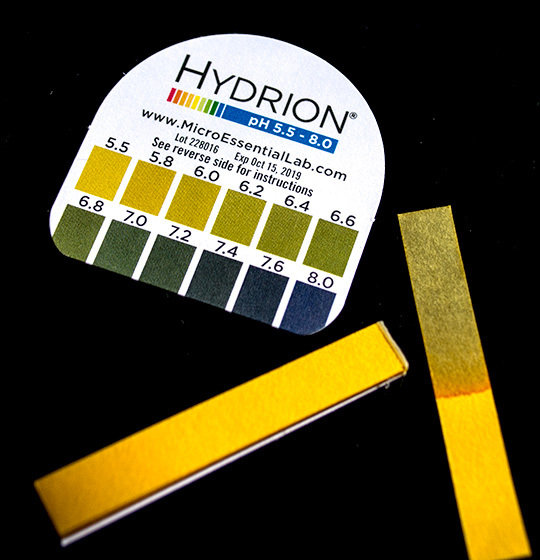 That is the reason HPDI offers Hydrion litmus paper, which is simply a litmus paper for measuring pH. Whether you use Hydrion brand papers won’t make a difference. Any good-quality litmus paper should work just fine. Use a small, one- or two-inch strip of pH paper to quickly dip into a saliva or urine sample (i.e., to test salivary or urinary pH). Hint: urinary pH tends to be more accurate because saliva tends to be affected by foods. Test salivary pH well away from meals. Order a container or two of pH Adjust, which we’ve purposefully kept low cost so both health professionals and individuals can make it a regular part of their pH balancing regimes. At $19.95 for retail customers (and less for HPDI resellers/wholesale customers), you will see that there is significant value for the price of pH Adjust. As for serving size, one container provides 250 one-gram servings (about a rounded 1/4 teaspoon). Even if you were to take larger amounts (like I do), say up to one teaspoon daily, there would be nearly 63 servings per container. That’s enough for two full months of servings assuming daily usage. And if you (or your clients) suffer from long-term, chronic acidosis due to a potential variety of causes, then you have much more to gain. Stop the spiral of acidity from keeping you from attaining much better balanced pH levels—and thereby improved health—by trying our simple blend of minerals in bicarbonate, carbonate, and glycinate forms, called pH Adjust. Then measure your pH using litmus paper—and see the difference for yourself. Litmus paper doesn’t lie, and it gives you a reliable indicator of the progress you’re making and your current pH status in real time. 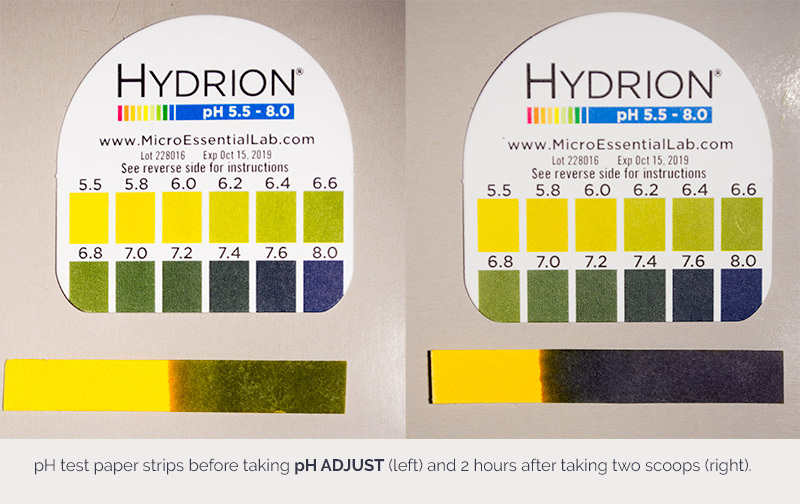 After using pH Adjust and measuring your results with litmus paper, then decide for yourself. Is pH Adjust worth its name? Does it effectively help you balance your pH? We think your answer will be “yes.” We believe you will love pH Adjust as much as we love it. Today HPDI launches a new product: pH Adjust. The new formula was created by Dr. Hank Liers, PhD. As its name implies, its primary application is to help balance pH levels in the body. That is, to support the creation of alkaline conditions — or alkalinization. Because pH Adjust alkalinizes the body, it thereby may effectively counteract overly acidic conditions (acidosis), including acidic conditions in the digestive tract, blood, kidneys, and other organ systems. Given the fact that acidosis—including chronic, low-grade acidosis—is common among individuals living in industrialized nations consuming high-levels of processed foods and other acid-forming foods, pH Adjust represents a simple, yet powerful means for achieving a healthy acid-base balance in the body. HPDI specializes in the formulation of nutritional supplements, including vitamin formulas such as multivitamins and other foundational supplements, advanced antioxidant formulas, high-RNA superfoods, and various mineral products, including magnesium. pH Adjust may be considered a mineral product. Yet, it is different than any other HPDI formula. That is, pH Adjust is not primarily formulated to provide nutrients to meet nutritional needs. Rather, the formula supports optimal health by facilitating improved acid-alkaline balance in the body. It may be used to effectively neutralize acidic conditions, and help counteract the tendency toward acidosis that persists among many individuals. Health experts know that pH balance is extremely important, and that acidosis in the body contributes to various states of less than optimal health. It is known that acidic conditions can lead to adverse effects in many bodily systems, including the circulatory system, immune system, skeletal system, excretory system, muscular system, and reproductive system. Chemically, pH stands for hydrogen ion concentration. The pH scale runs from 7 to 14, and pH 7 is considered neutral. A pH value of less than 7 is considered acidic whereas a pH value of greater than 7 is considered basic or alkaline. In the body, the ideal pH is somewhat alkaline: 7.30 to 7.5. For therapeutic purposes, individuals can for short periods of time (from a few days to a couple weeks) raise their pH levels to 8.0. That is, short-term increases in pH (to 8.0) can be useful for rapidly changing conditions in the body from acidic to basic (alkaline). Herman Aihara (author of Acid & Alkaline) and others have contributed to our understanding of acid and alkaline states in the body, and the roles played by foods in creating either conditions of acidity or alkalinity. In general, protein foods are “acid-forming” foods whereas most vegetables are “alkaline-forming” foods. A table of acid and alkaline forming foods are on our website at Effect of Food on Body Chemistry. Thus, proteins (containing more nitrogen) tend to form acids in the body whether or not they themselves are acid, and vegetables (containing more potassium) tend for form bases in the body whether or not they themselves are basic. This fact supports the importance of vegetables in the diet not only for nutrients, but also as a means for ensuring acid-base balance. An excellent food that provides a high potassium content is Dr. Hank’s Vegetable Soup. This soup tastes great and can help to keep a healthy acid-base balance in the body. Potassium-containing foods provide the body with potassium that it can use to create alkaline conditions. Sodium can also support alkaline conditions in the body. In fact, potassium and sodium work together in the sodium-potassium pump that pumps sodium ions out of cells and potassium ions into cells using ATP, and that performs many essential functions, including nutrient transport, cell-volume regulation, and nerve conduction. Danish chemist Jens Christian Skou shared the 1997 Nobel Prize in Chemistry for having discovered this pump, i.e., the ion-transporting enzyme, Na+, K+ -ATPase in 1957 while at the University of Aarhus in Denmark. It is notable that most individuals in Western societies obtain more than sufficient sodium and often less than sufficient potassium. Excessive sodium intake is associated with adverse effects on cardiovascular health. Based upon this information, we have chosen a 3:1 ratio of potassium to sodium in the pH Adjust formula so that it consistent with a heart-healthy diet. The best way to measure pH levels is to use litmus paper. HPDI offers litmus paper in rolls (Hydrion brand) for this purpose providing about 100 tests per roll. You can test salivary or urinary pH. In order to test salivary pH, simply use a small strip of pH paper to dip into a small amount of saliva. Advantages of pH paper include rapid results, ease of use, and cost effectiveness. The color of the litmus paper indicates the pH level in saliva. Most litmus paper comes with an indicator chart showing colors corresponding to various pH levels. Alkaline states will generally produce a dark green, blue or purple color (most basic). Acidic states will range from yellow (most acidic) to light green. Salivary pH and urinary pH are significantly affected by recent food consumption and other factors, so it it best to test pH hours after meals. We prefer to measure urinary pH since results are more consistent. Measuring urinary pH is a simple as placing a few drops of urine on the paper or dipping the paper into a sample cup. It is best to measure your pH in the morning before consuming foods or drinks. Salivary and urinary pH are affected by recent food consumption, so re-test several hours after eating, and additionally throughout the day. A consistent pH measurement of less than 7.0 indicates that you are too acidic (values less than 6.2 show extreme acidity). This indicates that you should consume more alkaline forming foods and/or take pH Adjust. A single dose of pH Adjust can change conditions in the body from acidic to alkaline within a few hours. As we mentioned, pH Adjust is not primarily formulated to provide minerals or other essential nutrients. HPDI has other products (like multivitamins and single-nutrient formulas) for that purpose. However, pH Adjust is a mineral providing formula. That is, it provides potassium (in the forms of bicarbonate and glycinate), magnesium (in the form of carbonate), and sodium (in the form of bicarbonate). And while the levels of potassium (141.6 mg or 4% daily value) and sodium (47.8 mg or 2% daily value) per dose of pH Adjust are relatively small, the level of magnesium is significant (105 mg or 26.3% daily value). Moreover, the levels of these minerals in pH Adjust are balanced, so that sufficient potassium is obtained relative to sodium, and that sodium remains low in the formula (for reasons previously considered). Note that the amounts of minerals listed (above) are obtained per dose, so additional doses will correspondingly increase the amounts of minerals. However, multiple doses should not significantly increase sodium levels. For example, more sodium may be obtained from a single salty snack than one or two doses of pH Adjust. Supplements Facts table from pH Adjust product label. One dose is 1/4 teaspoon. For extremely acidic conditions, you can take 4–10 doses per day, depending on the level of acidity and using pH paper as a guide to ensure that pH levels remain balanced. That is, the goal is to balance pH and to not become too alkaline (a condition of alkalosis may occur above pH 8.2). pH ADJUST may be used to increase salivary and urinary pH; counteract overly acidic conditions in the digestive tract, blood, and kidneys; and to supplement the body with the minerals potassium, magnesium, and sodium. The product contains (in powder form) potassium bicarbonate, magnesium carbonate, potassium glycinate, and sodium bicarbonate. Each serving (about ¼ tsp) contains about 300 mg of bicarbonate, 260 mg of carbonate, 142 mg of potassium, 105 mg of magnesium, 48 mg of sodium, and 100 mg of glycine. The minerals potassium, sodium, and magnesium are key substances that are involved in many important functions in the body. When combined in bicarbonates (potassium & sodium), carbonates (magnesium), and glycinate (potassium) these chemicals can help to adjust and balance pH that are crucial to body function. The processed food diets with a high protein content consumed by many people in the US and elsewhere produce conditions in the body of acidity. This in turn leads to decreased oxygenation of our cells and a greater use of anaerobic processes in metabolism. This, in turn, leads in inadequate ATP (energy) production and the presence of unwelcome anaerobic cells and organisms. Bicarbonate is a major element in our body. Secreted by the stomach, it is necessary for digestion. When ingested, for example, with mineral water, it helps buffer lactic acid generated during exercise and additionally reduces the acidity of dietary components. Additionally, it has a prevention effect on dental cavities. Each ¼ tsp of pH ADJUST contains about 300 mg of bicarbonate. Bicarbonate is present in all body fluids and organs and plays a major role in the acid-base balances in the human body. The first organ where food, beverages and water stay in our body is the stomach. The mucus membrane of the human stomach has 30 million glands which produce gastric juice containing not only acids, but also bicarbonate. The flow of bicarbonate in the stomach amounts from 24.4 mg/hr for a basal output to 73.2 mg/hr for a maximal output. Thus at least 500 mg of bicarbonate is secreted daily in our stomach. This rate of gastric bicarbonate secretion is 2-10% of the maximum rate of acid secretion. In the stomach, bicarbonate participates in a mucus-bicarbonate barrier regarded as the first line of the protective and repair mechanisms. On neutralization by acid, carbon dioxide is produced from bicarbonate. Effects of ingested bicarbonate: For digestion, bicarbonate is naturally produced by the gastric membrane in the stomach. This production will be low in alkaline conditions and will rise in response to acidity. In healthy individuals this adaptive mechanism will control the pH perfectly. To modify this pH with exogenous doses of bicarbonate, some clinical experiments have been conducted with sodium bicarbonate loads as high as 6 g. Only a transient effect on pH has been obtained. It is quite possible that bicarbonate in water may play a buffering role in the case of people sensitive to gastric acidity. Thus bicarbonate may be helpful for digestion. The most important effect of bicarbonate ingestion is the change in acid-base balance as well as blood pH and bicarbonate concentration in biological fluids. It has been studied particularly in physically active people. Among the types of acid produced, lactic acid generated during exercise is buffered by bicarbonate. In a study on sports, a dose of 0.3 g per kg of body weight of sodium bicarbonate was given (15.25 g bicarbonate for a man of 70 kg) to subjects before performing 30 minutes cycling. While blood pH was increased and then maintained constant with this bicarbonate load due to the changes in blood bicarbonate concentrations, increased acidity and decreased bicarbonate blood concentration were observed in controlled subjects. Prevention of renal stones: Bicarbonate also reduces the acidity of dietary components such as proteins. As an example, adding sodium or potassium bicarbonate to subjects on a high protein diet known to acidify urine and leading to hypercalciuria (high level of calcium in urine) has been shown to greatly reduce calcium urinary excretion. The effect has been observed with 5.5 g of bicarbonate supplement received daily for two weeks. A recent study highlights that a bicarbonate-rich mineral water could be useful in the prevention of the recurrence of calcium oxalate and uric acid renal stones. Controls water absorption: many oral hydration solutions contain bicarbonate showing the usefulness of bicarbonate to control water absorption in patients at risk of dehydration. Maintains blood pressure: Sodium intake is restricted in patients with hypertension, but it is demonstrated that the accompanying anion, such as bicarbonate, plays an important role. It is now well established that sodium bicarbonate does not raise blood pressure to the same extent as do the corresponding amounts of sodium chloride. Decreases dental plaque: Bicarbonate has been shown to decrease dental plaque acidity induced by sucrose and its buffering capacity is important to prevent dental cavities. Other studies have shown that bicarbonate inhibits plaque formation on teeth and, in addition, increases calcium uptake by dental enamel. pH ADJUST contains about 260 mg of carbonate (and 105 mg of Mg) in the form of magnesium carbonate. Magnesium carbonate is used as an antacid that gets converted to Magnesium Chloride (MgCl) and CO2 by stomach acid. MgCl is a well absorbed form of magnesium. The functions of the key minerals in pH ADJUST are described below. Each serving (about ¼ tsp) of pH ADJUST contains 142 mg of potassium, 105 mg of magnesium, and 48 mg of sodium. Resting cellular-membrane potential and the propagation of action potentials in neuronal, muscular, and cardiac tissue. Due to the electrostatic and chemical properties, K+ions are larger than Na+ions, and ion channels and pumps in cell membranes can differentiate between the two ions, actively pumping or passively passing one of the two ions while blocking the other. Helps to regulate fluid levels in the human body. Preventing sun stroke or heat exhaustion by replacing the loss of essential electrolytes. Supports brain function – the brain is very sensitive to change in sodium levels of the body; deficiency of sodium often manifests as confusion and lethargy. Along with properly hydrating the body, it is also important to supplement one’s body with mineral-rich juices (including potassium, magnesium and sodium) to prevent muscle cramps. Is an important hydrating product that defends against the free radicals that accelerate the aging process. Helps to eliminates excess carbon dioxide in the body. Helps to facilitate the absorption of glucose by cells, resulting in the smooth transportation of nutrients in the body’s cell membranes. Supports acid/base balance by altering the proportions of acid-base alkali phosphates in the body. Shares an association with chlorides and bicarbonates in maintaining a sound balance between positively charged and negatively charged ions. INGREDIENTS: Potassium bicarbonate, magnesium carbonate, potassium glycinate, and sodium bicarbonate. DIRECTIONS: As a dietary supplement, take ¼ tsp in 4–8 ounces of purified water preferably away from food, or as directed by a health care professional. For extremely acidic conditions (pH consistently less than 6.2), try 4–10 doses per day, depending on acidity level. you may take multiple 1/4 tsp doses at once—we ourselves often take 1 tsp in a single dose. Use pH paper to ensure pH levels remain balanced, and do not become too alkaline (alkalosis may occur above pH 8.2). DOES NOT CONTAIN: wheat, gluten, rye, barley, oats, corn, yeast, egg, dairy, soy, GMOs, sugar, wax, artificial preservatives, flavorings, or colorings.